The cowboy stepped closer. Cassie could make out a scowl. Dark eyes snapped a foreboding anger. Raven black hair framed chiseled features, searing them into Cassie’s brain. Her toes curled involuntarily. She rubbed Hope’s coat vigorously. Who the hell was he? And to top it off, he didn’t even seem to notice her. His eyes appraised only the horse. 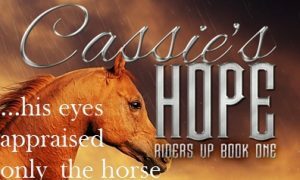 High stakes, a fiery Irish redhead, her stunning racehorse, and a fiercely loyal rancher. I love his intensity and fixation – on the horse! Terrific snippet and I’m really wondering about this guy inagoodway. My new grandson’s toes curl involuntarily when you stroke his sole, but I’m pretty sure nobody’s touching her sole — although maybe her soul.